Bio Notes: Thomas Henry Wyatt was born at Lough Glin, Co. Roscommon on 9 May 1807, the son of Matthew Wyatt, a magistrate and his wife Anne Hillier. He was a second cousin of Samuel Wyatt and James Wyatt. 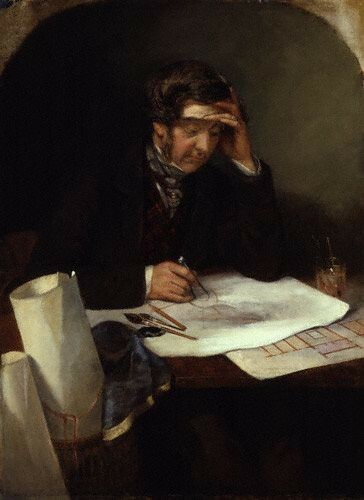 He was articled to Philip Hardwick and remained as assistant, commencing practice on his own account in 1832, having secured the surveyorship on his own account of Hackney. Through the influence of his uncle Arthur Wyatt, who was the South Wales land agent of the Duke of Beaufort, he obtained a considerable practice in Wales, and through the recommendation of the Beauforts he established a very large country house practice, mostly in a Tudor idiom similar to that of the Hardwicks. The link was consolidated by his marriage to Arthur's daughter Arabella Montagu Wyatt. In 1838 Wyatt took David Brandon into partnership and on 7 January 1839 he was admitted FRIBA his proposers being Peter Frederick Robinson, Thomas Cundy, George Moore, Henry Edward Kendall and John Shaw. The partnership with David Brandon was dissolved in 1851, Wyatt thereafter practising on his own. He was President of the RIBA from 1870 to 1873 when he received the Royal Gold Medal, and Honorary Secretary of the Institute from 1879 until his death in London on 5 August 1880. He was buried at Weston Patrick, Hampshire, where he had an estate. His wife Arabella had predeceased him in 1875.